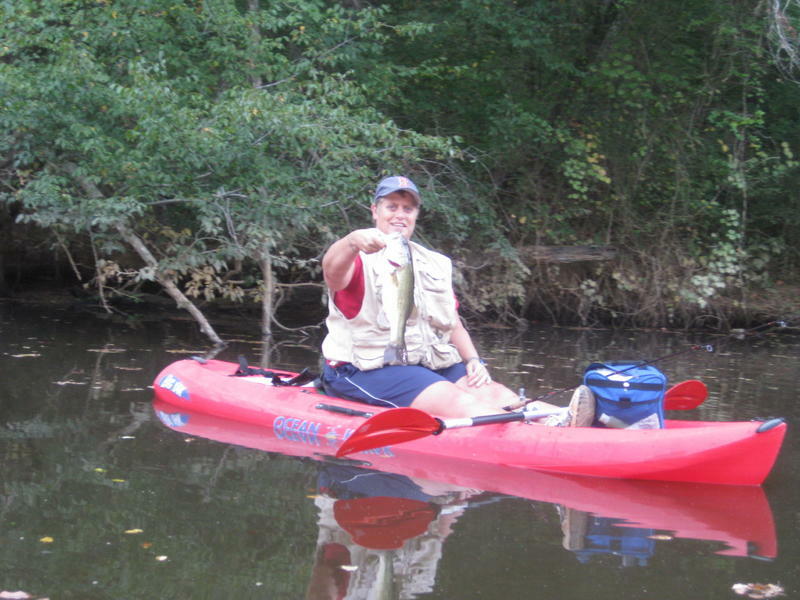 On Sunday morning I got up early and headed to a local flow to try for some river bass. I haven't been on a river in a couple of weeks, so I was anxious to get out. I was joined by good friends Gary Ribet and Wendy Tonker. 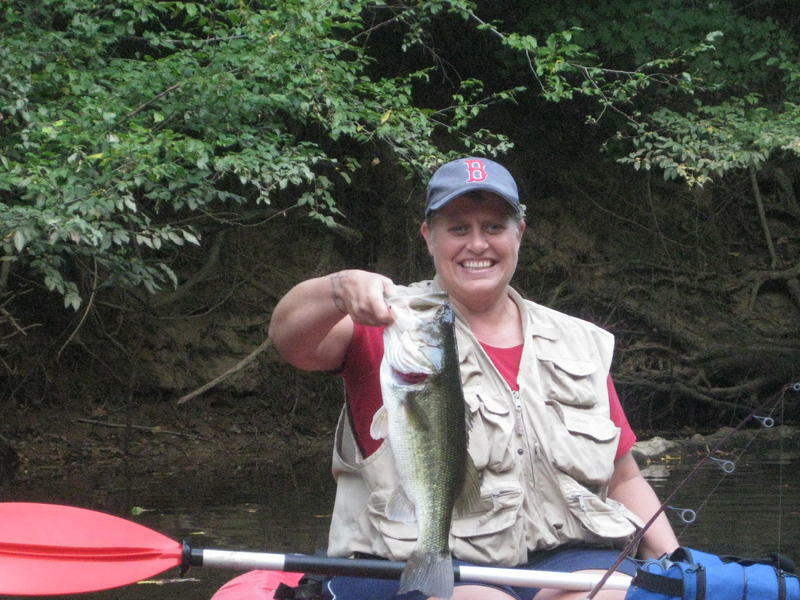 It would be one of Wendy's first trips in a kayak. It was definitely one of those foggy, mystical, beautiful mornings! We launched around 6:45 AM, just after first light. I decided to head down river to hit a couple lay downs where I have had a lot of luck, while Gary and Wendy headed up river. I fished over the first log with no luck, but shortly after (and about 10 minutes into the day) I got a good bite. The fish nailed my plastic worm and ran hard down the bank. It took everything I had to keep him out of the river-side brush and trees as well as keep him from pulling me around. After a great fight, I boated him....a 21", 5 lb bass. It took me a while to get a good photo because there was no good place to access the bank. After sinking up to my knees in silt and sand, I finally managed a couple of the 'voodoo' bass. What a way to start the day! Pretty bass to start the day! I then wanted to fish one more laydown and figured I would turn around and catch up with Gary and Wendy after. However, my plans changed. I caught fish on the next 2 laydowns using a buzzbait, then the next log with a plastic worm. I spent the next hour or two fishing down river and catching fish with regularity. None of them were over 2.5 lbs, but it was fun. I ended up with 4 fish on a buzzbait, 6 on a plastic worm, and 1 on a jig by the time I decided to turn around. I also had a beaver pop up only a couple feet from my kayak. I am fairly sure I interrupted his Sunday morning beauty sleep. I headed up river and asked how the other two had done. Wendy had caught a couple nice fish, including one just under 3 lbs and another over 4.5 lbs. Gary had lost a bunch of fish and was still skunked. I briefly conversed with them before Wendy had to head back. Gary and I proceeded up river and I picked up two more small bass on plastic worms. We then got to an area I had not fished before. 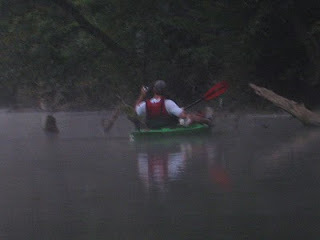 We beached the boats and waded through a long, shallow stretch until we got to an area with a high and open bank. Gary and I climbed up the bank and started fishing. 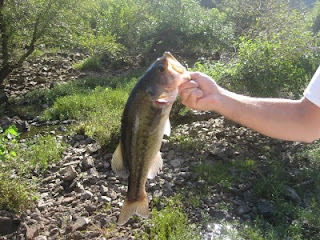 Shortly after we started, I spotted and sight fished a 2-2.5 lb bass. We were also seeing carp, tons of sunfish, and a lot of gar...including some giants. I had never actually landed a gar, so I decided I was going to give it a shot. The gar were acting aggresively toward a minnow bait that Gary was using, but they just weren't getting the hook into their bony, rock hard mouths. I decided to switch to a Sebile Magic Swimmer swimbait and give it a try. I spotted a gar, threw the bait past him and used a steady reel, jerk, pause retrieve. The small fish slashed at the bait numerous times, but I just couldn't hook him. I then threw another cast along the far bank and felt a good bite. I thought for sure it was a small gar, but it turned out to be a pretty 3 lb bass. I then saw a nice gar and jerked my swimbait in front of him....it was on! The fish was big and he initially went on a strong run. After tiring the fish a little, we realized there was no way to land the fish on the high bank, so we would have to walk him about 50 yards down river. At first, the fish was cooperating. But, after a couple of minutes he decided to turn and make another deep run. As he shook his head, the hook popped out of his mouth and he swam away. Gary and I estimated the fish to be 36+" and easily over 10 lbs - possibly pushing 15+ lbs. I hooked a couple more gar for short, but sweet moments. Unfortunately, I just could not land them. 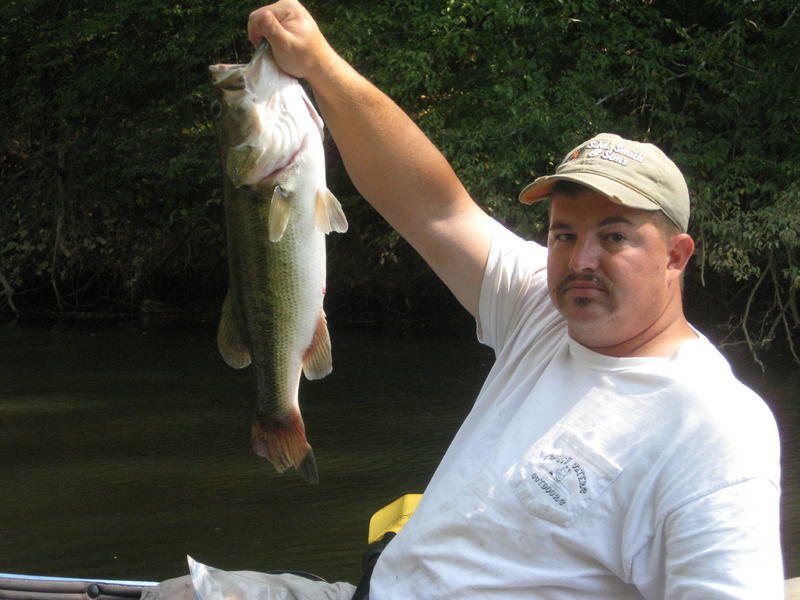 I also managed to lose another bass on a worm before we left that area and headed back down river. Somehow, Gary was still fishless and he was eager to get on the board. We began fishing back down river and I managed 2 quick bass. After another 15 minutes, Gary got on the board with a small bass. Shortly after, I heard a splash and looked over to see his rod doubled over. A fish was quickly pulling him toward the bank. After a nice fight, he landed the bass - a pretty 5 lb 3 oz fish. As we fished the rest of the morning, Gary and I managed a few more bass. I ended the day around noon having landed 20 fish - all bass. Most of them were caught on plastic worms as well as a few on a buzzbait, swimbait, and jig. 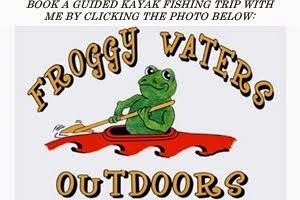 I think there will be a return trip to this area in my near future - to chase big bass and a giant gar! Tight lines! This guy was waiting to meet us at the take out...fall is near! Dang, nice day for sure.